Chicken and black bean casserole anyone? This casserole dish is family approved and never fails to receive compliments whenever it is served. One quick look at the ingredients list and you will easily see why this recipe is quick and easy to prepare. But don't be deceived, the ingredients mix well for a wonderful smell and flavorful taste. Give the recipe a try and this could very well become one of your favorite casserole dishes. Preheat oven to 350. 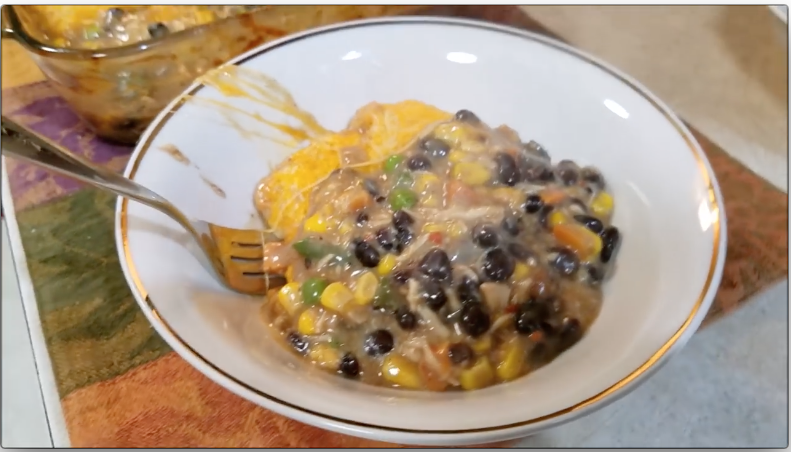 Mix together chicken, black beans, mushroom soup, cream of chicken soup, cheddar cheese soup, salsa, garlic powder, onion powder, cumin, chili powder, black pepper and 1 cup of shredded cheddar. Grease a 13X9 casserole dish. Spread a layer or tortillas in the pan. Top with 1/2 the chicken mixture. Add more tortillas, top with other ½ of the chicken. Top with a final layer of tortillas. Spread the remaining 2 cups shredded cheddar over the top. All these ingredients have made my mouth water so much. I am just not able to hold my thirst. I am going to have a full chicken today. And I am going to put the bill on you for giving me the recipe to one of the best dishes I am ever going to make. This tastes great, but make your own cream sauces rather than using the terribly high calorie, fat, and sodium filled creamed soups. Substitute a sauce made with evaporated skimmed milk, sautéed mushrooms and onion done in a teaspoon of olive oil, and add 1 tablespoon of flour to thicken. This will reduce the calories and fat by HALF, and the sodium by more than half.